The collection is not complete, but only for now. When I got the thumbs up about the LA trip, one of the first things I started to put together was, of course, my shopping list. Obviously the first top products I wanted to get were from Sephora, but all of the next were from NYX. 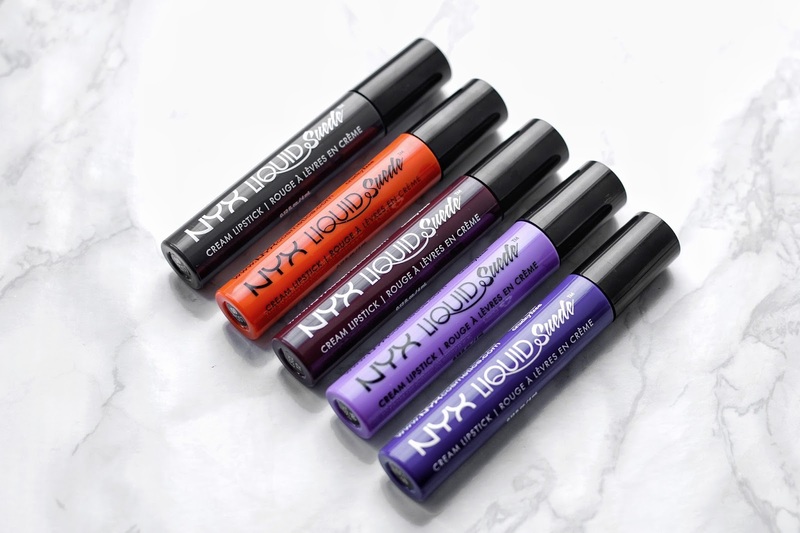 And in that NYX shopping list these Liquid Suedes were the Nr. 1 products I wanted to get my hands on! If you don't know about NYX Liquid Suede you've been probably living under a rock or you don't use social media, because they were everywhere couple of months ago. I still run into videos on instagram where girls show how they apply it and how it looks in the end. And no wonder everyone was raving about them when they came out. The formula is something else! After trying Lip Lingerie I have to say that I actually prefer the formula of the Liquid Suede lipsticks. These cream lipsticks glide on beautifully and set into a comfortable matte finish. It's also said to be waterproof, but I haven't been in the shower or swimming with any of them on so I can't confirm that. But what I can confirm is the pigmentation of them. When I did the first swatches I was blown away and I still am whenever I use them. I have never seen a liquid lipstick so pigmented. Pigmentation wise they are quite similar with Sephora's Cream Lip Stains. When we visited the NYX store in Del Amo Fashion Center I went straight to the lipstick section. When I saw the Liquid Suedes, I saw only the ones that were the most popular shades - and those were none of the ones I wanted to get. After walking around the store, I looked again at the lipstick section, just scanning it from afar and then I froze - I saw my shades!!! They were just a little bit higher located than the "popular ones". I may have run to that stand, I don't remember, it was a blurr, haha, but I had them all in my basket pretty much two minutes later after noticing them from across the store. My top two shades I wanted to get were Stone Fox and Sway. After swatching them in the store and seeing how amazingly pigmented they were I also picked Amethyst and Orange Country. And then I decided that I needed something red from the range so I picked Soft-Spoken that has this reddish brown undertone. If I was at the store now I think I would also pick Tea & Cookies, Vintage & Sandstorm. Basically I would just complete my collection, because it does get addicting - collecting the whole range of the lipsticks. 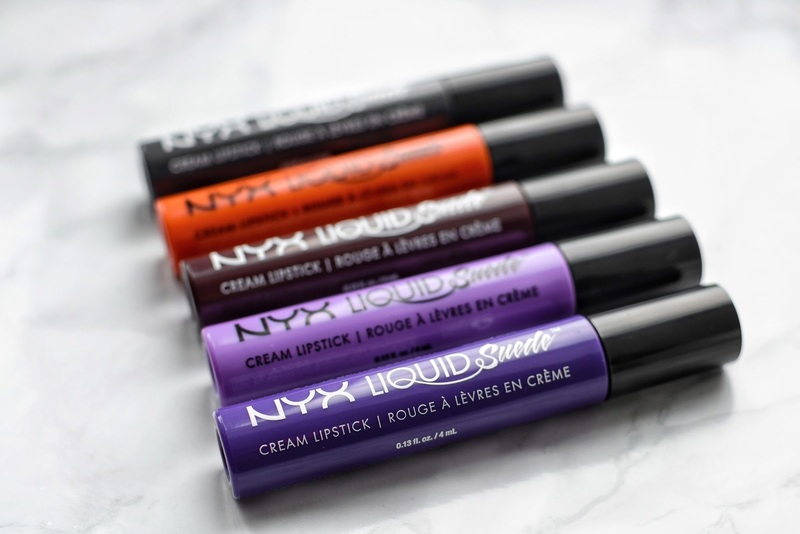 5 comments on "NYX PROFESSIONAL MAKEUP | LIQUID SUEDE"
Soft spoken - burrrrrvīgs tonis!!!! Sarkanais, ko dabūju izmēģināt, ir f-a-n-t-a-s-t-i-s-k-s! Ja būtu labāks tonis, izkonkurētu manu MAC. Nopietni. Jūtu, ka tiks izpirkts stends, ja nokļūs arī līdz Latvijai.